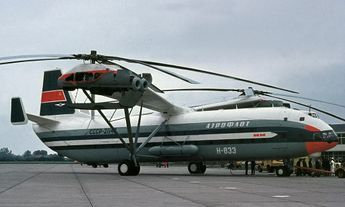 The Mil V-12 (NATO reporting name Homer), given the project number Izdeliye 65 ("Item 65"), is the largest helicopter ever built. 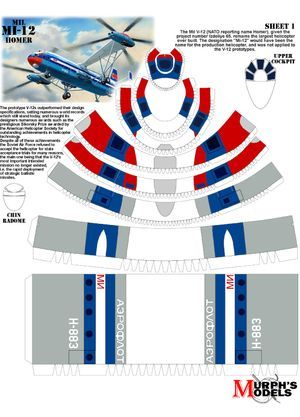 The designation "Mi-12" would have been the name for the production helicopter, and was not applied to the V-12 prototypes. 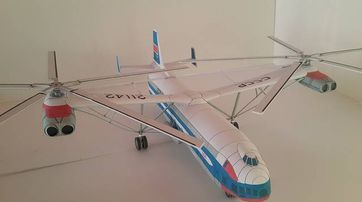 The first prototype, given the registration SSSR-21142, made its first flight on 10 July 1968 from the Mil factory pad in Panki to the Mil OKB test flight facility in Lyubertsy. In February 1969, the first prototype lifted a record 68,410 lb payload to 9,682 ft. On 6 August 1969, the V-12 lifted 97,455 lb to a height of 7,398 ft, also a world record. The prototype V-12s outperformed their design specifications, setting numerous world records which still stand today, and brought its designers numerous awards such as the prestigious Sikorsky Prize awarded by the American Helicopter Society for outstanding achievements in helicopter technology. The V-12 design was patented in the USA, Great Britain and other countries.